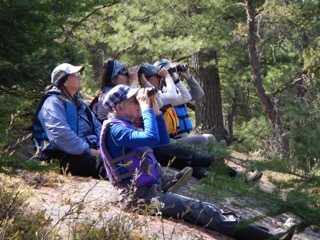 Join Wilderness Canoe Guide Rob Kesselring and Naturalist Sue Plankis on the 8th Annual Birding in the Boundary Waters Wilderness Adventure. This year the experience will be lodge-based with overnight accommodations abeautiful Bearskin Lodge, on the edge of the Boundary Waters Wilderness. During the days, by canoe, we will explore the BWCAW seeking breeding birds in this astonishing wilderness area. For seven years participants have averaged looks at over sixty bird species. Birds we have seen in previous years? Many warbler species including the Black-throated Blue Warbler and Northern Waterthrush; Great-Horned, Barred and Northern Saw-Whet Owls; Loons; Black-backed Woodpeckers; Boreal Chickadees; Winter Wrens; Veerys; Merlins and Bald Eagles. Back at the lodge there are hiking trails, a sauna and a magnificent whirlpool bath overlooking East Bearskin Lake. After a wholesome, and healthy supper, the evenings will be spent by a campfire or the fireplace. There will be time to chat about the day’s sightings and enjoy informal presentations focused on the fauna, flora and history of the BWCAW – and maybe we will catch a good look at an owl. The blend of birding, paddling a canoe, and living in the wilderness for a few days makes this experience unique, exciting and memorable. ***The only expense not included are alcoholic beverages which may be brought to, or purchased at the lodge. Rob has led 29 Arctic canoe expeditions, 83 BWCAW/Quetico trips. He has paddled 150 rivers worldwide and is a Licensed Wilderness Guide and popular outdoor writer. Sue has been a Canadian Style and Freestyle Canoe instructor. She is an expert birder, has an incredible ear for northern forest bird songs. She has assisted on many scientific naturalist studies. This is her 8th year leading the Birding in the Boundary Waters Wilderness Adventure. This year “Value Season,” the quieter time of year when Bearskin offers our lowest rates, begins on October 7th and lasts until December 13th. Stay at beautiful Bearskin longer, for less. Check our rate charts for each cabin price, or give us a call to get the details. Ready to tie the knot, but can’t figure out where? 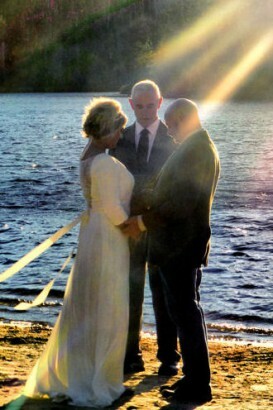 Have a Wilderness Wedding at Bearskin Lodge. Bearskin has a wedding officiant who is ready and willing to do your ceremony in the woods, on an island, up on a bluff, in a dog sled or, as in this classic old Bearskin photo, paddling a canoe. You make a plan, we’ll help you make it happen. Click here for more wedding info. Special rates may be available on cabin lodging for you and your wedding party if you will need several cabins. Join our e-mail newsletter list to receive special offers available only to Bearskin Newsletter subscribers. The newsletter arrives in your e-mail box about once a month and contains updated Bearskin news as well as discounted Bearskin prices and last minute deals. State and county taxes, as well as tips or gratuities, are not included in any package prices. Taxes in Minnesota vary, depending on the product or service. Call our front desk to get precise tax figures for your package purchase or special offer.